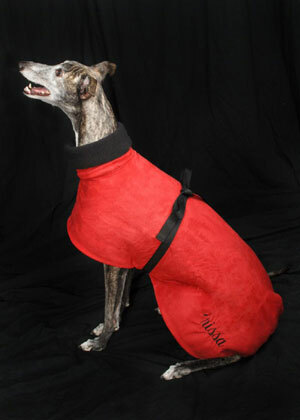 Our coats are designed to fit a sighthound's slim build and signature shape. 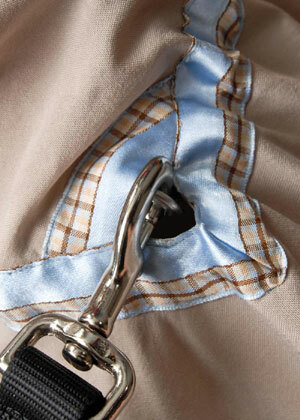 We use quality material that is cut, sewn and finished to the highest standards and specialize in attention to detail. We guarantee all of our workmanship. 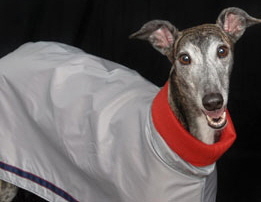 Single layer winter coats are made from mid-weight Polarfleece or Berber (nubbly) fleece. The standard closing is a strap that holds the coat firmly against the hound's body. 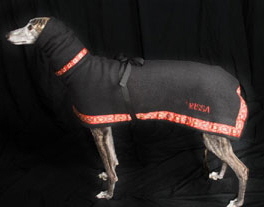 Optional closures are a wide bellyband, twill tie straps, a belly closure that extends to the dog's chest, and/or a crupper at the tail to hold the coat in place for the most active hounds. All are available with a matching elastisized snood for further neck and ear protection. The polar fleece is currently available in black, grey, camel, red, safety orange, dark green, chocolate brown, blue, or standard green camouflage although there are many other color options. Contact us about the type and color that you want for the lining / reversible coat. · Any winter coat or raincoat can be lined or made reversible. · Most coats can be monogrammed. · All coats can be custom fitted. · We accept cash, checks and PayPal (coming soon!). · We ship US Mail unless you direct us otherwise. 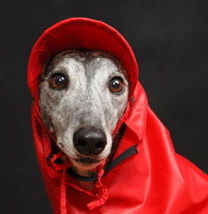 Our raincoats come in several weights. All are water repellent (good for eveything but a drenching downpour). A few are made from a waterproof, yet breathable, synthetic fabric that seems to withstand anything. The lightest weight is water repellent single ply ripstop nylon. 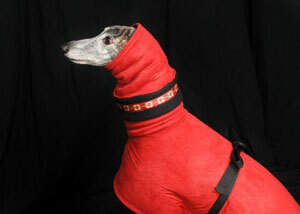 It comes in red or black, with trim at the bottom, neck and snood. We have also used silver ripstop and lined it with red! The two ply is heavier and is waterproof. It is available in red, teal or black, trimmed like the single ply coats. The three ply is slightly heavier and also is waterproof. Currently we have it in royal blue only but can investigate other colors if you are interested. The "diamondback" coats are mid-weight and water repellent. They come in cranberry or brass, and have a matching snood with adjustable elastic at the ears. Any of these coats could be lined in flannel or polarfleece, if you so desire. Our suncoats come are available in two styles - one with only one leash opening and less decorative trim, the other with two leash openings and more decorative trim. Both are cape-like but secured with an adjustable strap at the belly. They are made of an UVA / UVB sun protective fabric rated at 30 to 50 (highest possible). They are designed to fit loosely, yet provide maximum coverage against these harmful rays. They float outwards as the dog moves, yet stay in place without twisting. 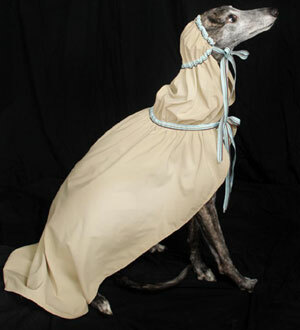 They have one or two leash openings which, depending upon the style chosen, can be custom-placed for your hound. Current available colors are beige, khaki, pink or pale blue. 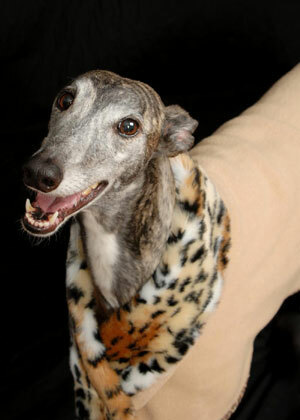 We have snoods available to match all of our coats. They are long enough to cover the coat collar to provide warmth, yet still allow easy access for a leash. Any snood can be made with adjustable elastic so that it stays over the ears even through vigorous playing. From time to time, we offer hats and visored head-coverings to match your raincoat. These coats are 100% custom-made. 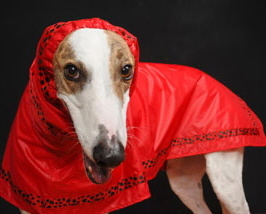 They are tailored to your hound's exact measurements. You pick the material, fur, trim, and closures, and we do the rest. Prices depend on the options that you choose. 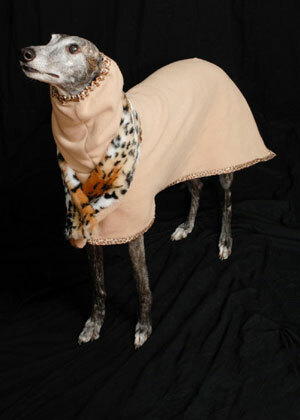 Uptown Hound coats are those intended for special occasions. 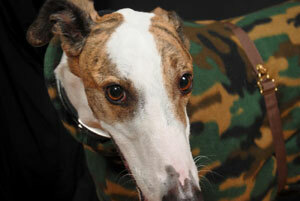 They are durable but are so beautiful you will not want your hound running around in the mud in these coats. Many are reversible with ultrasuede, microfibers, or raincoat fabric. 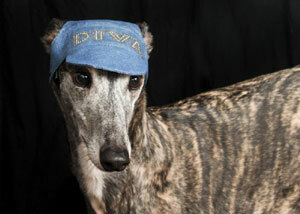 They will include a head covering; some include monogram personalization and/or special "fur" collars.